Samsung SM-G900F Spotted on AnTuTu, Could It Be Samsung Galaxy S5? There’s a lot of fuss going on all over the internet about the upcoming Samsung Galaxy S5. Many believe that Samsung SM-G900F, which has been spotted on various occasions and was also spotted on logistics tracking website Zauba, is possibly Samsung’s upcoming flagship device known as Samsung Galaxy S5. 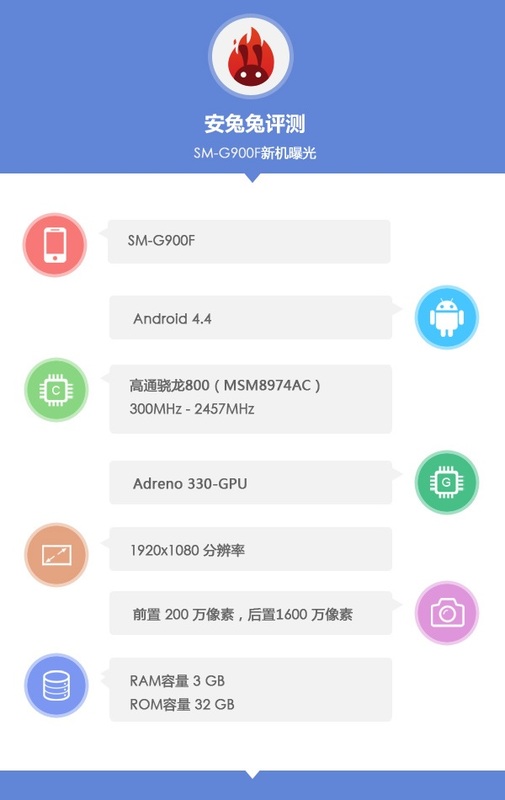 Recently, a Samsung handset with a model number SM-G900F made an appearance on AnTuTu, which they think (we do too) is the upcoming Samsung Galaxy S5. In the past, we’ve seen several leaks revealing the possible specifications of the alleged handset, and it seems things might be different after all. The handset’s specifications were revealed on AnTuTu, and judging by the looks of it, they may not be as impressive as we all thought. Additionally, the folks at AnTuTu are quite sure that this is the international version of the handset. Let’s just skip the chase and see what the results show. The purported Samsung Galaxy S5 is powered by the powerful Snapdragon 800 (MSM8974AC version) with Adreno 330 GPU and 3GB of RAM on board, opposed to what we’ve heard that it will feature 4GB of RAM. Other specifications include a full HD display sporting 1080p resolution, 16MP ISOCELL camera and 2MP front-facing camera. If you don’t remember, we’ve seen several reports, including GFXBench results for a handset carry SM-G900S model number, suggest that it will come with QHD resolution of 2560 x 1440 pixels. Other rumors suggest it will also bris Iris Scanning technology on board. These are just rumors so a pinch of salt is required. Nothing is official until it’s from the Korean OEM itself. So, don’t be disappointed and wait for Samsung to make things official. Rumors suggest Samsung will unveil the handset by late February, possibly before MWC 2014 kicks off. We’ll update you once we have more information.